International Military Tribunal trial of war criminals at Nuremberg, December 10, 1945. Courtesy of National Archives and Records Administration. The Nuremberg Trials were a series of trials most notable for the prosecution of prominent members of the political, military and economic leadership of Nazi Germany. The trials were held in the city of Nuremberg, Germany, from 1945 to 1946, at the Nuremberg Palace of Justice. The first and best known of these trials was the Trial of the Major War Criminals Before the International Military Tribunal (IMT), which tried 24 of the most important captured leaders of Nazi Germany. It was held from November 20, 1945 to October 1, 1946. The Nuremberg Trials were an attempt to bring to justice those leaders of Nazi Germany who were not only responsible for World War II itself, but also the Holocaust, perpetrated against millions of people of Central and Eastern Europe. There was a second set of trials of lesser war criminals that was conducted under Control Council Law No. 10 at the U.S. Nuremberg Military Tribunals (NMT), including the Doctors' Trial, among others. Papers released on January 2, 2006, from the British War Cabinet in London have shown that as early as December 1942, the Cabinet had discussed their policy for the punishment of the leading Nazis if captured. British Prime Minister Winston Churchill had then advocated a policy of summary execution with the use of an Act of Attainder to circumvent legal obstacles, and was only dissuaded from this by pressure from the U.S. later in the war. In late 1943, during the Tripartite Dinner Meeting at the Tehran Conference, the Soviet leader, Josef Stalin, proposed executing 50,000-100,000 German staff officers. Not realizing that Stalin was serious, U.S. President Franklin D. Roosevelt humorously suggested that perhaps 49,000 would do. Churchill denounced the idea of "the cold blooded execution of soldiers who fought for their country." However, he also stated that war criminals must pay for their crimes, and that in accordance with the Moscow Document, which he himself had written, they should be tried at the places where the crimes were committed. Churchill was vigorously opposed to executions "for political purposes." U.S. Treasury Secretary, Henry Morgenthau Jr., suggested a plan for the total denazification of Germany; this was known as the Morgenthau Plan. The plan advocated the forced deindustralization of Germany, along with forced labor and other draconian measures similar to those that the Nazis themselves had planned for Eastern Europe. Both Churchill and Roosevelt supported this plan, and went as far as attempting its authorization at the Quebec Conference in September 1944. However, the Soviet Union announced its preference for a judicial process. Later, details were leaked to the public, generating widespread protest. Roosevelt, seeing strong public disapproval, abandoned the plan, but did not proceed to adopt support for another position on the matter. The demise of the Morgenthau Plan created the need for an alternative method of dealing with the Nazi leadership. The plan for the "Trial of European War Criminals" was drafted by Secretary of War Henry L. Stimson and the War Department. After Roosevelt died in April 1945, the new president, Harry S. Truman, gave strong approval for a judicial process. At the meetings in Tehran (1943), Yalta (1945) and Potsdam (1945), the three major wartime powers, the U.S., USSR, and the United Kingdom, agreed on the format of punishment to those responsible for war-crimes during World War II. France was also awarded a place on the tribunal. The restriction of trial and punishment by the international tribunal to personnel of the Axis countries has led to accusations of victor's justice and that Allied war crimes could not be tried. It is, however, usual that the armed forces of a civilized country  issue their forces with detailed guidance on what is and is not permitted under their military code. These are drafted to include any international treaty obligations and the customary laws of war. For example at the trial of Otto Skorzeny his defense was in part based on the Field Manual published by the War Department of the United States Army, on October 1, 1940, and the American Soldiers' Handbook. If a member of the armed forces breaks their own military code then they can expect to face a court martial. When members of the Allied armed forces broke their military codes, they could be and were tried, as, for example, at the Biscari Massacre trials. The unconditional surrender of the Axis powers was unusual and led directly to the formation of the international tribunals. Usually international wars end conditionally and the treatment of suspected war criminals makes up part of the peace treaty. In most cases those who are not prisoners of war are tried under their own judicial system if they are suspected of committing war crimes – as happened the end of the concurrent Continuation War and led to the war-responsibility trials in Finland. In restricting the international tribunal to trying suspected Axis war crimes, the Allies were acting within normal international law. Because Nuremberg had been appointed "City of the party rallies," there was symbolic value in making it the place of the Nazi party's demise. The International Military Tribunal was opened on October 18, 1945, in the Supreme Court Building in Berlin. The first session was presided over by the Soviet judge, Nikitchenko. The prosecution entered indictments against 24 major war criminals and six criminal organizations—the leadership of the Nazi party, the Schutzstaffel (SS) and Sicherheitsdienst (SD), the Gestapo, the Sturmabteilung (SA) and the High Command of the German army (OKW). Hans Frank I º G G Death Ruler of the General Government in occupied Poland. Expressed repentance. Franz von Papen I I º º Acquitted Chancellor of Germany in 1932 and Vice-Chancellor under Hitler from 1933. Later, ambassador to Turkey. Although acquitted at Nuremberg, von Papen was reclassified as a war criminal in 1947 by a German de-Nazification court, and sentenced to eight years' hard labor. He was acquitted following appeal after serving two years. Part of the defense was that some treaties were not binding on the Axis powers because they were not signatories. This was addressed in the judgment relating to war crimes and crimes against humanity contains an expansion of customary law "the Convention Hague 1907 expressly stated that it was an attempt 'to revise the general laws and customs of war,' which it thus recognised to be then existing, but by 1939 these rules laid down in the Convention were recognised by all civilised nations, and were regarded as being declaratory of the laws and customs of war which are referred to in Article 6 (b) of the [London] Charter." The implication under international law is that if enough countries have signed up to a treaty, and that treaty has been in effect for a reasonable period of time, then it can be interpreted as binding on all nations not just those who signed the original treaty. This is a highly controversial aspect of international law, one that is still actively debated in international legal journals. Attractive as this argument may sound in theory, it ignores the fact that it runs counter to the administration of law in every country. If it were true then no spy could be given a legal trial, because his case is always heard by judges representing the enemy country. Yet no one has ever argued that in such cases it was necessary to call on neutral judges. The prisoner has the right to demand that his judges shall be fair, but not that they shall be neutral. As Lord Writ has pointed out, the same principle is applicable to ordinary criminal law because "a burglar cannot complain that he is being tried by a jury of honest citizens" ("The Legality of the Nuremberg Trials," Juridical Review, April, 1946). U.S. Supreme Court Chief Justice Harlan Fiske Stone called the Nuremberg trials a fraud. "[Chief US prosecutor] Jackson is away conducting his high-grade lynching party in Nuremberg," he wrote. "I don't mind what he does to the Nazis, but I hate to see the pretense that he is running a court and proceeding according to common law. This is a little too sanctimonious a fraud to meet my old-fashioned ideas." Associate Supreme Court Justice William Douglas charged that the Allies were guilty of "substituting power for principle" at Nuremberg. "I thought at the time and still think that the Nuremberg trials were unprincipled," he wrote. "Law was created ex post facto to suit the passion and clamor of the time." ↑ John Crossland, Churchill: Execute Hitler without trial, The Sunday Times January 1, 2006. Retrieved November 20, 2008. ↑ Teaching American History, Tehran Conference: Tripartite Dinner Meeting, November 29, 1943. Retrieved November 20, 2008. ↑ Yale University, Judgment: The Law Relating to War Crimes and Crimes Against Humanity. Retrieved November 20, 2008. ↑ General Military Government Court of the U.S. Zone of Germany, Trial of Otto Skorzeny and Others. Retrieved November 20, 2008. ↑ Yale University, Judgment: Doenitz. Retrieved November 20, 2008. ↑ Alpheus T. Mason, Harlan Fiske Stone: Pillar of the Law (New York: Viking, 1956). de Villemarest, Pierre. Untouchable: Who protected Bormann & Gestapo Müller After 1945. Aquilion, 2005. ISBN 1-904997-02-3. Gilbert, G.M., Nuremberg Diary. Da Capo Press, 1995, ISBN 0-306-80661-4. Harris, Whitney. 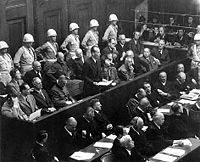 Tyranny on Trial: The Evidence at Nuremberg. 1954. Persico, Joseph E. Nuremberg: Infamy on Trial. Penguin Books, 1994. ISBN 0-14-016622-X. This page was last modified on 14 December 2018, at 15:58.